Acey Slade’s first solo album isn’t really what you could have expected from the ex-MURDERDOLLS/TRASHLIGHT VISION… member. 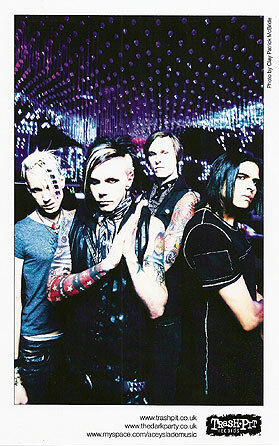 No horror punk metal or sleaze street punk here, Acey chose to explore the electro-rock territory with The DARK PARTY. He tells us a bit more about it and his future projects. Can you talk about the album? Why did you choose a drum & bass producer (Shaun Morris)? -He didn’t know anything about my old bands so there was NO WAY it could sound like anything else I’ve done. I mean, it would be me-so it would still have Acey Slade in it. But, nobody to kinda influence things toward a specific direction. Did you have a precise idea about the way you wanted the band to sound before recording or did it really come into shape while recording the album? -Nope. The idea was no idea. I mean, I had a lot of points of referance that have nothing to do with each other. Some Visual Kei/Japanese rock bands, old post punk..which stems from glam ya know! Do you see this album more as a solo album or as a brand new band? -Yea, it’s a solo album. But now, the live band is ‘the band’. We are working on new music-as a unit all the time. So, it’s changed a bit. How did you get to work with TrashPit records? -I just wanted to work with a company that wanted to work! They have done everything they promised and more! Great, great label! There’s a cover of The CULT’s “She Sells Sanctuary” on the album. Any other cover song you’d like to play with the DARK PARTY? -Funny. We are recording a free cover album EP to come out later this year. It’s going to have Plexi, Redd Kross, Kate Bush and Hanoi Rocks covers on it. We also did ‘As Heaven is Wide’ by Garbage for the US version of the album. Speaking of The CULT, they are a band who experimented with different styles through their career but they still managed to have their own identity… Do you see this as an example? -Yes. They changed with each album and I plan on doing the same. How would you describe your live shows compared to the ones you played with your former bands? -A lot more musicianship. Probably because I play less, ha,ha..But more fun and more moody. I wanna incorporate more theatrics soon. Imagine you have to choose 5 albums made in the 2000s. Which ones and why? Wow. The past 10 years. Rancid ‘Industructable’, Ladytron ‘Witching Hour’, AFI ‘Sing the Sorrow’, APop ‘You and Me Against the World’, Wildhearts, ‘Wildhearts Must Be Destroyed’. We talked about the MANIC STREET PREACHERS last time I interviewed you. Your thoughts on the last album? -It’s very good. I saw their 1st NYC show in over 10 years a few weeks ago. It was very emotional to me. Great show! Nowadays, lots of people just download music or listen to it directly from streaming websites. Isn’t it sad? Don’t you think they’re missing something? Nevertheless, as CD sales keep on collapsing, vinyl ones have been increasing these last two years. Can you imagine vinyl being the main music support again in a couple of years? -Nahh..I mean that would be cool. I still believe in the hard copy of an ‘album’. I think Vinyl pants will make a bigger come back that Vinyl records. Ask Lady Gaga, ha,ha..
You live in New York, what do you like and/or diislike there? What are the good places to go to there these days? -I like how continental it is. It’s really the port of the world and I love experience new people, new music and new art. The whole world come here. New York has a lot of that. Sadly, the rock scene here has been bad the past few years. The good part is its so safe. Humm the rock n roll leaves the city and it becomes safer…is there a connection. Last movies and books you’ve enjoyed? -The Death of Bunny Munro’ by Nick Cave. Movies, ‘Dead Winter’ a Norweigin Zombie Nazi movie and ‘Old Boy’ a Korean drama-very twisted! What’s next for the DARK PARTY? -This fall will see us touring quite a lot! We have a live album and DVD ready, a remix album, and this free covers EP. And-I wanna record our 2nd album. …this is just the lighting of the fuse!